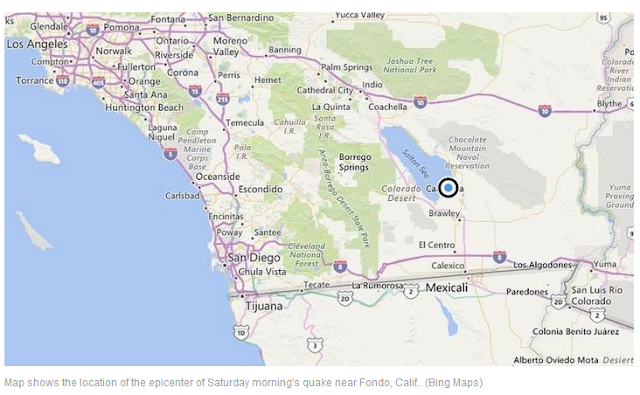 A shallow magnitude 3.1 earthquake was reported Saturday morning four miles from Fondo, Calif., just south of the Salton Sea, according to the U.S. Geological Survey. The temblor occurred at 2:45 a.m. Pacific time at a depth of 5.0 miles. According to the USGS, the epicenter was 14 miles from Brawley, 22 miles from Imperial, and 26 miles from El Centro in California and 38 miles from Mexicali, Mexico. In the past 10 days, there have been three earthquakes of magnitude 3.0 or greater centered nearby.